Radishes are quick-growing vegetables that prefer a rich, fertile soil. 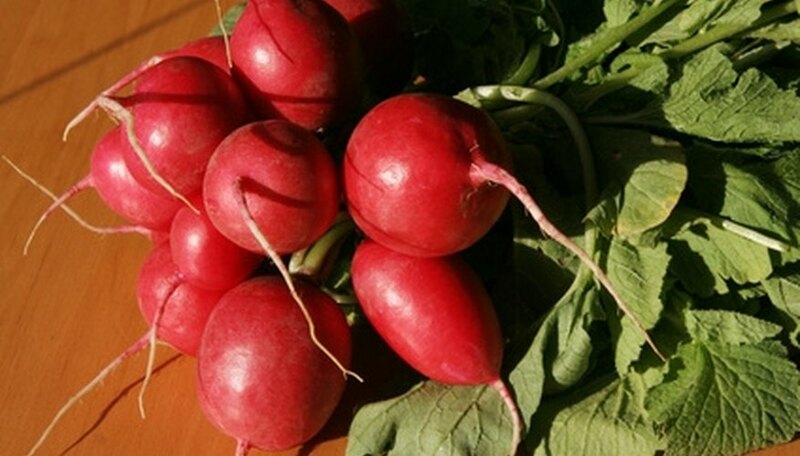 It takes spring radishes only one month to reach maturity and winter radishes take approximately 2 months. Harvest them by digging them up as soon as they are mature to preserve the taste and texture. 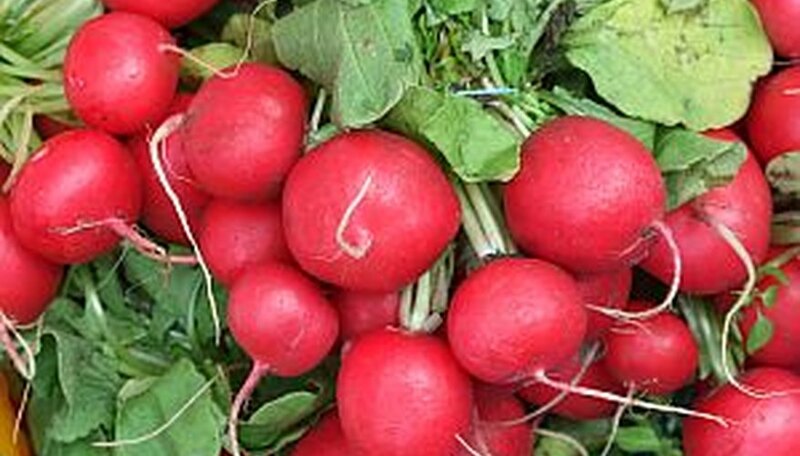 Harvest winter radishes from the soil only as you need them. 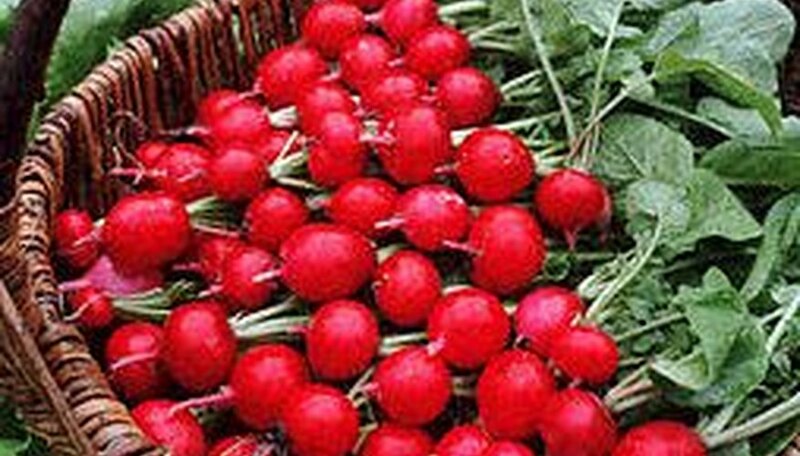 Watch your radishes grow quickly and harvest them at the peak of perfection for a delicious radish crop. Plant small crops of radishes every 2 weeks so that you will have radishes maturing in batches as the weeks go by. Watch the radishes as they mature. Carefully use the trowel to loosen spring radishes when they are at least 1/2 inch in diameter and as large as 1 1/2 inches in diameter. Do not leave spring radishes in the ground to grow larger than this or they may become cracked. Harvest winter radishes in the same fashion with the garden trowel, but you may leave these radishes in the ground until ready to use. Cut the green tops from the radishes as you dig them. If you do not remove the tops, the radishes will shrivel. Keep spring radishes for up to 2 weeks in the refrigerator in plastic storage bags with ventilation holes. Keep winter radishes in storage boxes filled with damp sand. Place the storage boxes in a cool location that will not freeze and store for up to 4 months. Work the soil in the garden bed early in the spring. Turn over the plot and remove weeds, sticks and rocks. Amend poor soil with 2 to 4 inches of compost or manure dug into the top 8 inches of the garden bed. Sow watermelon radish seeds directly into the garden bed early in spring. Radish seeds are not frost sensitive and can withstand some light frosts after planting. Space the seeds 3 inches apart and cover with a quarter inch of garden soil. Look for signs of the emerging seedlings in seven to 14 days. Once the watermelon seedlings grow 2 inches tall, thin them to a spacing of six inches. Water once or twice a week to keep the soil consistently damp around the developing seedlings. Consistent moisture is important when radish seeds are in the germination process. Plant a second set of watermelon radish seeds in mid- to late spring and a third planting in late summer for continued harvest into the fall. Harvest watermelon radishes 55 to 60 days after planting. Dig under the radish with a garden fork and lift it out of the soil. Shake off the dirt and wash the root. Radishes are one of the fastest and easiest vegetables to grow, and they grow well in any climate. Many varieties can be harvested as soon as three weeks after the seeds are planted. The trick to harvesting tasty radishes is not to leave them in the ground too long. Radishes left in the ground too long become woody and bitter. Visit our seed shop for some interesting varieties to help you break out of that 'round red radish' habit. Radishes are grown throughout the year, but most varieties prefer cool weather. Sow radishes successively every two to three weeks for a continuous crop. You can plant them in shady spots where other vegetables are reluctant to grow. You can sow radishes with slower growing vegetables since they will mature quickly and can be harvested long before other vegetables will need the space. This technique, called intercropping, is especially useful in small gardens where space is at a premium. You can also sow radishes with your container grown vegetables. Plant seeds directly where they are to grow about 1/4 inch deep and 2 inches apart. Seedlings will appear in 1-2 weeks. Keep the soil moist during the growing period. It's a good idea to feed seedlings weekly with a complete liquid fertilizer. Cabbage moth and white butterfly caterpillars are the primary pests that affect radishes. Treatment with Bt will usually remedy the problem. Aphids will sometimes attack, but they are easily discouraged with Soap-Shield. Radishes are a good companion for vine crops such as cucumbers, squash, melons and pumpkins because they discourage the cucumber beetle. Other good companion crops include beans, carrots, cucumbers, lettuce, and peas. The small globe varieties are eaten fresh in salads and used as garnishes, while the long root forms are used for cooking. For more information about radishes see Radical Radishes. Plan to sow the seeds as soon as the ground can be worked. Radishes are not sensitive to frost. Dig 2-inches of compost into each section that is 12 to 18-inches wide and 8-inches deep. To each 10-foot row add one pound of 10-10-10 fertilizer. This will prepare the soil for the radish seeds. Plant each seed in the soil, about ½ inch deep, and space 1-inch apart. This may vary according to radish variety, so read your seed packet for additional information. To have radishes throughout the season, plant at two week intervals, stopping when summer reaches its maximum temperature for the season. Water the plants weekly, keeping the soil moist. Select a 6- to 8-inch clay container for growing your radishes indoors. Be sure the container has drainage holes for best results. Add potting soil to the container, filling to within 1 inch of the rim. Water well to moisten the soil clear through. Sow the radish seeds directly over the soil, cover lightly with about 1/4 inch of soil, and spray to moisten. Cover the container with a piece of plastic wrap to create a greenhouse effect and help the seeds germinate quicker. Set the container in a south-facing window where it will receive plenty of sunlight. The radishes need at least eight to 10 hours of sunlight for best results. If necessary, place a fluorescent light overhead to provide enough hours of light. Remove the plastic wrap as soon as the seedlings have developed two to three leaves each. Thin the seedlings at this time, pulling out the weaker seedlings and leaving about 1 inch space between the healthy ones. Water the radishes once a day to keep the soil moist. Do not let the soil dry out between watering. Apply a balanced, water-soluble fertilizer after thinning the seedlings. Use a 5-5-5 liquid fertilizer and water in well after applying.